Stevenson has forced at least one turnover in 51 straight games, however, it had a streak of 26 straight games with an interception snapped in the season opener at Frostburg State. The last game without an interception was October 25, 2014 against FDU-Florham. The last game without a takeaway was November 3, 2012 at Lycoming. The Mustangs set program records for points (65) and margin of victory (58) in September 30's 65-7 win over Misericordia. The previous record for both categories was set in a 57-0 win over FDU-Florham in 2014. Stevenson also set a record for total offense with 677 yards. Individually, Dan Williams threw for a program-record 398 yards, while freshman kicker Ian Gould had 17 points, a single-game scoring record for a kicker. Stevenson has made three straight postseason appearances. The Mustangs made their inaugural NCAA appearance in 2016, while the program enjoyed bowl wins in 2014 and 2015, winning an ECAC bowl in 2014 and the Centennial-MAC Bowl in 2015. Junior Ashton Leschke was named the ECAC South and MAC Commonwealth Defensive Player of the Week this week after having two half-sacks, a forced fumble and eight tackles in the Albright win. Stevenson is 30-10 (.750) since the start of the 2014 season. Senior Preston Addo ranks seventh nationally in receiving yards with 832. He is averaging nearly 119 yards receiving per game and has gone over 100 yards receiving five times, including 165 yards on eight catches last week against Albright. 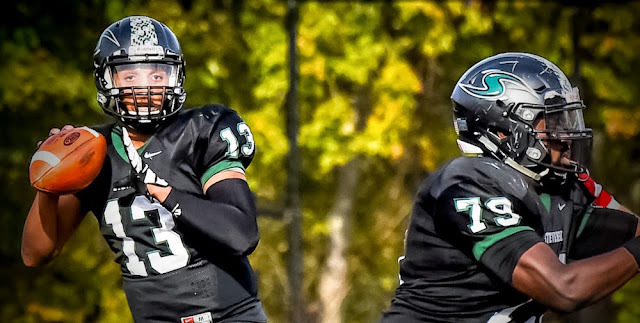 Stevenson leads the Middle Atlantic Conference in passing, throwing for 322.3 yards per game, and also ranks second the conference in pass defense, as opponents throw for just 172.0 yards per contest. The Mustangs rank second in total offense (415.1) and third in total defense (293.4). The Mustangs have outgained their opponents on offense in every game this season except the season opener at Frostburg State. Last season Stevenson outgained its opponent in seven of 11 games. The top two teams in the MAC who do not qualify for the NCAA Championship will compete in the Centennial-MAC Bowl Series. Behind league-leading Delaware Valley, Widener sits second, while Stevenson sits in a third place tie with Albright and Lebanon Valley. Widener has six defensive touchdowns on the season, tied for the Division III lead with defending national champion and top-ranked Mary Hardin Baylor. • Widener holds a 4-2 lead in the all-time series with Stevenson, but the Mustangs have taken the last two meetings, including a 45-21 victory in Chester, Pa. last season. In 2015 Stevenson broke through with a 31-20 Homecoming triumph for its first-ever win over the Pride. • Stevenson did not have a turnover in its last two home victories, a 38-9 win over King's on September 9 and a 65-7 win over Misericordia on September 30. Last season the Mustangs were 3-0 when they didn't commit a turnover and they were 3-0 when not committing a turnover in 2015 as well. • The Stevenson offense opened the first two games this season with big plays. • The Mustangs were picked second in the Middle Atlantic Conference preseason poll released in August, tied with Albright. Delaware Valley is the preseason favorite, although all three teams received first place votes from the league's 10 head coaches. • Stevenson posted its third shutout in program history with a 48-0 win over Misericordia on October 1, then followed up with a 19-0 blanking of then-No. 25 Delaware Valley on October 22. The other two shutouts came in 2014. The 48-point margin of victory is the third-largest in program history. • It has been 58 games since the Mustangs have played an overtime game, and it has only played two in its history. The last time the Mustangs went to overtime was September 8, 2012, a 29-22 overtime loss to Albright. • Defensive back Austin Tennessee, a consensus First Team All-American as a senior at safety, earned a rookie free agent tryout with the Minnesota Vikings last spring. • Junior linebacker Ashton Leschke was a CoSIDA Academic All-District selection last season. He is a biology major. • Quarterback Dan Williams threw a no-hitter for the Stevenson baseball team on April 2 against Albright this spring. He struck out five and walked two en route to the second no-hitter in Mustang baseball history. Individually, Dan Williams' 299.3 yards passing per game is 14th nationally. Devin Salisbury is 15th in receptions per game at 7.6, while Preston Addo is eighth in receiving yards per game (118.9) and his eight receiving touchdowns are good for 26th nationally. • Stevenson leads the MAC and is No. 32 nationally in third down conversions, converting at a 46% clip (46-100). Last season, the Mustangs converted on third down at a 42% clip. • Stevenson has been victorious in its last four Homecoming games with a pair of shutouts. Last season the Mustangs blanked Delaware Valley 19-0, while in 2014 Stevenson was a 57-0 winner over FDU-Florham. In 2015 Stevenson topped Widener 31-20. • Stevenson won the coin toss in each of its first six games this season, electing to defer each time, before Albright won the toss on October 21. The Lions, however, elected to receive. • Stevenson travels to Wilkes next Saturday, then wraps up the regular season on November 11 at home against Lycoming.